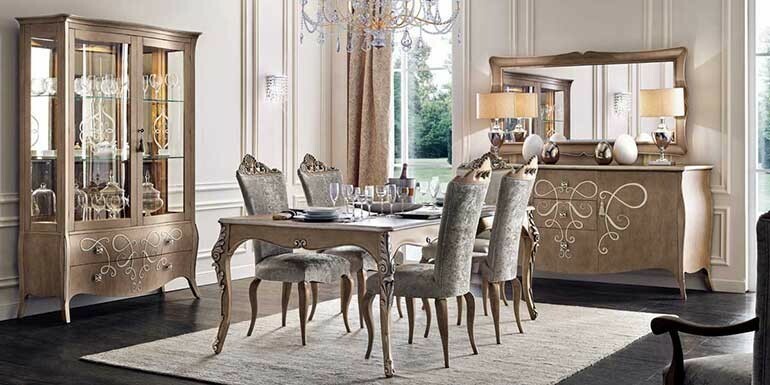 A new online proposal to show how Butterfly collectionís products can suit elegantly to a dining room. Butterfly is inspired to the harmony of nature and to Italian art. The sinuous movement of a butterfly flight is an inspiration for a product that maintain intact the artistic tradition of Italy. For this project we wanted to achieve an elegant and, at the same time, neat result. The sinuous lines of the display cabinet and the sideboard accompanied to the harmony of the chairs and armchairs built in solid Beach wood, surrounding the rectangular extendible table. On the display cabinet and on the sideboard, both made of cherry wood, the butterflyís flight is recalled through a delicate marquetry relief. The chairs and the armchairs are lined with top quality foam and upholstered with skillful craftsmanship. This dining space is lightened by soft colors and brightened by the wall mirror which gives light and enlarge the space. To discover in detail all the products of this Dining area, visit the interactive zone: you can explore all the details and click on the elements of the collection to get more information.